Last week we posted a blog providing a brief overview of surveys we have been running in Africa daily for the past 2 months. Those surveys covered Food Security and Energy in Africa. Now we are taking a brief look at Mobile Money, Health, and Media in Africa. Electronic payments and mobile money are fast taking over the banking world in certain nations in Africa, so we asked respondents if they had sent or received electronic payments in the last week. Tanzania and Kenya, where several prominent mobile money apps such as TigoPesa and M-Pesa have emerged, had the high percentages of respondents using mobile money, 39% and 32% respectively. South Africa also had 35% who said they had received or sent money electronically in the last week, whereas only 15% said the same in the Democratic Republic of Congo. 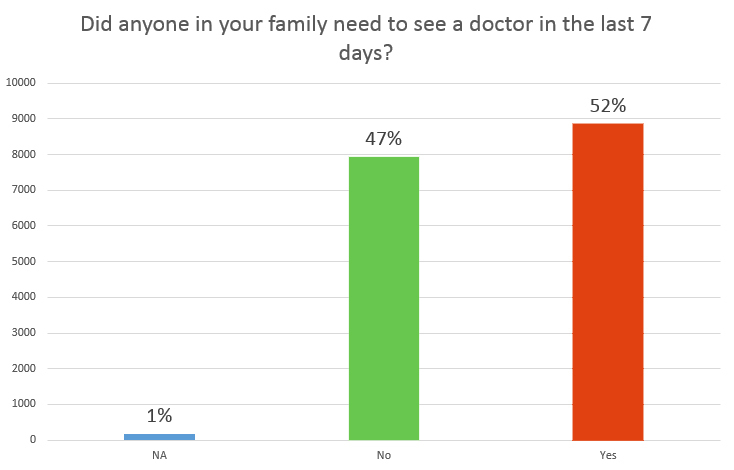 Our health-focused question asked respondents “did anyone in your family need to see a doctor in the last 7 days?” The results were clear, and demonstrate the need for access to doctors and preventative care in emerging markets: 52% of the 16,950 respondents said yes, and in countries including Uganda and the DRC the number was even higher. 62% of over 2,000 respondents in Uganda said they or a family member needed to see a doctor in the last week, and 59% in the DRC said the same. The final question we asked respondents for this survey was if they felt they could trust their local media, including newspapers, magazines, and radio. Press freedom in many African countries is still not a given, and the state can exert unofficial control over the press even in those countries which do have laws around freedom of the press. Freedom House, an independent press watchdog organization, estimates that out of 50 countries in Sub-Saharan Africa, only 3% of the total population has access to completely free press. Our results show a mix of trust across countries: in total, 35% did not trust their media across all 10 countries, but some countries had more trust in their media, including Tanzania, where 75% reported trusting their local media, and Kenya, where 69% said the same. While Reporters without Borders does not rank either of these countries extremely high on press freedom, they are about in the middle of the 179 countries ranked in 2013: Tanzania was #70 and Kenya #71. At GeoPoll we aim to understand the world through mobile data collection. These surveys provide a snapshot into the lives of people who do not always have a voice, and we continue to run surveys every day on important issues like food security and media habits. Keep checking our blog and following us on twitter to stay up to date with the latest GeoPoll insights! To run a GeoPoll survey of your own, contact us today. What does it take to dominate the oral health care market in Kenya?